The last few posts have all mentioned the pantry in relation to healthy meal making, and with good reason: The pantry is a vital link to manageable meal times. With the right ingredients stocked, meal making can be not only fast but interesting, as a previous post explained. 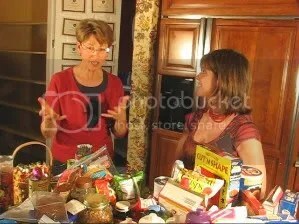 As important as stocking the pantry, however, is arranging it for speedy access. How frustrating if you can’t quickly grab an ingredient when assembling a meal. My book, Take Control of Your Kitchen, shows both how to stock and how to organize kitchen cupboards for quick and easy access. That’s why nationally syndicated home improvement columnist Marni Jameson phoned for an emergency session when she needed to write about pantry organizing–and get her own pantry in order. You’re sure to get a chuckle from Marni’s article, “Odeur du Jour Pushes Writer into Pantry Panic–and pick up a copy of Take Control of Your Kitchen if you’re ready to replace chaos with order in your pantry cupboards.